Margaritaville at select Thorntons convenience stores! Margaritaville Salsa and Tortilla Chips are now available at select Thorntons, your favorite place to stop when you are on the go. Stop in on the way to your next picnic, backyard barbecue or when you're craving a Taste of Paradise on your way home from work. Click here to find Margaritaville at Thorntons near you. 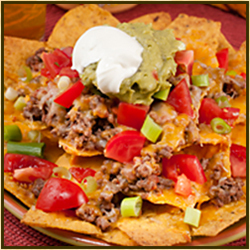 Cook beef in skillet over medium-high heat until browned.Add Margaritaville Salsa and continue cooking for 2 minutes. Arrange a layer of Margaritaville Restaurant Style Tortilla Chips on an oven safe plate. Add 1/3 cup Margaritaville Con Queso in Paradise Dip, then another layer of chips and another 1/3 cup queso, then final layer of chips with remaining queso. Top with remaining chips.